As we arrived and entered the hall the audience were greeted by the concert poster on the project screen, and Yaakov’s latest smash hit album “Cry No More” playing. This began to set the scene for what promised to be an amazing night ahead. Half an hour after the advertised start time the lights dimmed and the orchestra conducted by Yaakov’s producer – the multi-talented Yochi Briskman began a short overture consisting of various Shwekey hits. Accompanying the overture was a slideshow presentation of pictures of Shwekey at some of his concerts around the world, ranging from Jerusalem, New York, to Paris and London and even Mexico and South Africa. The chair for the evening, invited a community Rav, Rabbi Kimche to lead some tehillim for am yisrael and erets yisrael with its current troubles. After the Tehillim the local Shloimie Gertner burst onto the stage with a song called Vehiskin, the title track of his latest album and a fast tempo song that got the audience firmly in the mood for the concert. Shloimie then did another song, Koidesh, a beautiful slow hit song from his first album composed by Yossi Green and is a very popular Shabbat song. Shlomie then finished his set and left the stage, our chair told us how happy they were with 1500 strong crowd before welcoming Shwekey on to the stage in his 4th UK appearance. He entered and begun singing one of his earliest songs, Shehcheyanu, from his first album, the song had the crowd already on their feet. After a very long applause. cheers and shouts of welcome back, Shwekey decided to go for a slow song and picked the best slow song, Boee B’shalom from his previous album Libi B’mizrach which he decided to dedicate to all the Kallah’s in the audience. At the close of the song a very familiar fast introduction began and the crowd returned to their feet as Yaakov began Veshochanti, a great song from his 5th album Ad Bli Dai. This went straight in to Shefa Rav, a song written by Moshe Laufer for the first Caesaira CD. Closing the medley was a familiar song that I had not heard in ages, Hein Am of Leshem Shomayim. This marked the first of a few medley’s, I am a big fan of medley’s for a number of reasons, especially at concerts. Now it was time for another slow song, and the first song of the night from the Smash hit Cry No More Album, Olenu Leshabeach. Yaakov introduced these words from Davening by saying that since he has sung the song it had taken his tefilot to a whole new level. Yaakov then sa,ng a fast song from the same album, K’dai a great tune that is currently the 4th most played song in my iTunes. 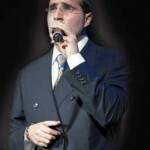 Last year at the same concert Yaakov said that a special crowd deserved a special medley, this year was no different as he sang the same number, an English medley consisting of three very powerful English songs. Abie Rotenberg’s Mama Rochel, Dveykus’s Tatte, and the beautiful Sh’ma Yisroel telling the story of how a Rabbi went to find all the lost Jewish souls after the Holocaust. At this point it was time for Shwekey to take a well-earned break, and a promotional video for Tikva Odessa, a Ukrainian orphanage which houses and cares for children from the Ukraine and former Soviet Union was shown. It is a charity well deserving of our money and I am not surprise it was the chosen charity of the concert. As Shwekey continued his break, Shloimie Gertner returned the stage with a song I hoped he would perform but did not think he would. It is a new song called Chayim and is quickly climbing in my iTunes top played songs. Its style is different to many songs I listen to and has a very catchy rhythm. Shloimie did another song before leaving the stage again, another one from his debut album, Im Ein Ani Li, this was the very first song of his that I ever heard and I instantly became a dedicated fan. Tonight I feel Gertner did a good job if showing how far he has come since I first saw him five years before, he is quickly proving that he is an act in his own right and not just a support act for the bigger stars. Now it was time for Yaakov Shwekey to return to the stage, and the percussionist had a short solo which meant it could only be one song, my favourite song from his Mizrachi album, written by Yonaant Razel, Rau Banim. It wasthe perfect song choice to get the crowd back together dancing again. Yaakov then began discussing the current situation in Israel, and mentioned how we need Yerushalyim in our prayers at all times and how could we forget that? He then invited Shlomie back to the stage to join him for Im Eshkocheich, a song that really does not need any introduction. The two of them then sang a song that many Kallah’s have walked down the aisle to, his version of Aishet Chayil from his 4th album. The final song of the medley was another early hit from his 1st album, Racheim, he ended the medley singing the end of it slightly quicker than normal that made things quite interesting. After Shloimie left it was time for another song from Cry No More, and the 2nd video of that album Lo Yaavod, a beautiful tune about Klal Yisrael uniting. It certainly worked as I saw Jews from all religious backgrounds dancing together as one, a very beautiful sight to see, especially in a time when many sects of Judaism feel alienated from the rest. The next song was song that was recorded in Caesaria and written by Yonatan Razel, the song quickly became one of the biggest songs the Jewish music scene had seen for a while, the amazing and beautiful Vehee Sheamda. There was now time for one more medley and the crowd continued to dance more and more. The first song was Ben Bag Bag from his 3rd album, followed by the title track of his mizrachik album Libi Bamizrach. The next song in the medley was Areivim from Ad Bli Dai and to finish it off was one of Yitzy Waldner’s greatest compositions, Ma Ma Ma from his 4th album, Leshem Shomayim. Shwekey then left to the stage to rounds of applause and plenty of noise from the crowd. Is that it? Really was that it? We knew something was missing, there was a song we were all anxiously waiting to hear, a song whose video has over half a million views on YouTube, a song which I have been listening to non stop, especially since the rockets in Israel have returned, a song which always make me want to cry, even though the song’s name intends to the opposite. It was good to see that I’m not the only who felt this way as everyone joined together to sing it. Please may Yerushalyim Cry No More. From the concert I have a few extra points to share, firstly as mentioned Shloimie Gertner is very quickly becoming an act himself and not a support act. And secondly Shwekey is facing a big dilemma to select songs at concerts, He has just released his 7th studio album, that’s over 70 songs to pick from, most of which are big hits. I do still think that it is great how he still sings some of his original hits like racheim and shehechaynu as well as his newer songs, if only the concert lasted longer who knows what extra sings would have been thrown in. Thank you for reading, please feel free to comment your thoughts. A wonderful piece Shasha, G-d willing may we look forward to an 8th album in the very near future! love this review, makes us feel like we are actualy there!